Grill or broil the eggplant 3 minutes on each side, until brown. Heat water in a large nonstick skillet coated with cooking spray over medium heat. Cover and cook 7 minutes or until tender, stirring mixture occasionally. Increase heat to medium-high. Uncover pan, and cook for 2 - 3 minutes or until most of the liquid evaporates. Spread half of pan mixture in bottom of a deep baking dish coated with cooking spray. Top with half the pepper, half the tomatoes and all the mozzarella. Spread remaining mushroom mixture over cheese. Top with remaining eggplant, pepper and tomatoes. Sprinkle with Parmesan and breadcrumbs. Remove cover, and return to oven for 5 minutes. Plus 9 othersFrom around the world! It was just OK to me. Too much heat to enjoy the flavors. 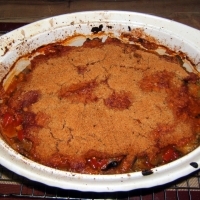 See Baked Eggplant With Tomato Mushroom Sauce for more. This looks great. I am so into vegetables! Great post ... I love these flavors... Thanks Jojoba.